← Royce Chocolates: Why the fuss over chocolate? Today, as I got ready to leave work, I sent my mom a quick message. “S & R tayo?” (Let’s go to S & R? ), to which she responded with a quick yes. Today marks the first day of S & R’s Members’ Treat, a special thank you sale they have for their members. Getting to the parking lot of the Alabang branch, we were quite surprised. It was full! It’s never been this full on a weekday night, especially not that late. I didn’t realize that the sale was that big a deal. Sure enough, it was packed inside as well—you’d think it was a Sunday afternoon, not a drizzling Thursday evening. People were milling about with grocery carts stockpiled with goodies; friends were greeting friends in a festive atmosphere that felt more like a party than a sale at a warehouse club. There are a lot of discounts and special buy one-take one offers to be had. From electronics to furnishings to groceries. Pillows, pillowcases and comforters were selling like hotcakes. I was eyeing a tall bookcase myself, thinking it would be perfect for showcasing my doll collection. Hopping from aisle to aisle yielded awesome items. Nutella’s 50 PHP cheaper. The New Zealand Rib Eye steaks were less 100 PHP. The Starbucks 4-pack of bottled coffee cheaper by 85 PHP. Lovely, lovely tubs of Ben & Jerry’s (not discounted though). 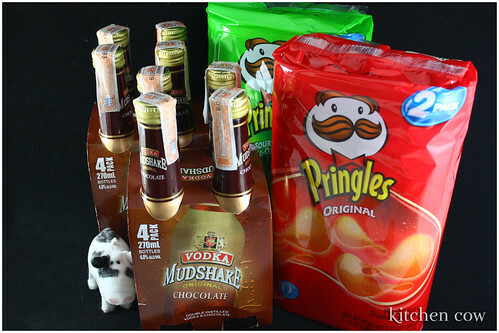 Of course I had my favorite deals for the evening: 2-pack Pringles Potato Crisps from the US (versus the weirdly thick Asian-distribution Pringles) at just 99PHP, cheaper by 35 pesos and the 4-packs of Chocolate Vodka Mudshakes at 175 PHP, cheaper by 85. There were more great deals but frankly, pushing a cart with loads of cheap Potato Chips and Mudshakes, I was happily grinning already. They say happiness can’t be bought. Well, in my case, not only was I able to buy it, but at a great discount, too. S & R Membership Shopping’s Members’ Treat Sale is from Sept. 18-21 from 8am to 10pm. Branches are at Aseana-Baclaran, Alabang, Congressional and Fort Bonifacio. This entry was posted in culinary events, food shopping. Bookmark the permalink. darn! i have officially failed at convincing the hubby to bring me there this weekend. sigh! I love the cow in the pict! Moo! 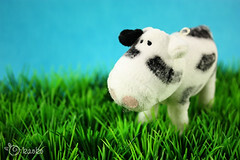 Little Cow sez Ohai Mimi!